The Amazing Fun Center, welcomes groups and offers special discounts to groups of 12 or more when you call in advance to schedule your group visit. Your group will have an amazing and enjoyable time trying all of our incredible activities! 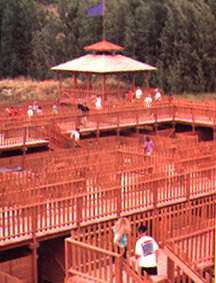 Our main attraction has always been the Glacier Maze, but now it's bigger and better than ever, since it was completely redesigned and rebuilt in 1994. Most people take about an hour to find their way through the Maze. There are many overhead walkways to cross, four checkpoints, and four towers to explore; along with various clues to help those having difficulty. We have one of the finest 18-hole Miniature Golf Courses in the Flathead Valley. This group golf course features unique hole designs, sand traps, hazards and obstacles that are always challenging. Also, we have Bankshot Basketball. It can be played by people of any age, size and skill level. Perhaps our "coolest" activity is the Thriller Bumper Boats. These fast but quiet electric boats that will maximize your fun. Your whole group can cool off by bumping each other under the fountain or spraying each other with the built-in electric squirt guns.